With the cold weather really coming in (don’t laugh, we have icicles! ), we spend a lot more time coming up with creative ways to play. One thing I personally love doing is taking a bath and reading a book. While my kids have inherited the bath part, they have not inherited the book part, so I try to give them something fun to do while in there! So on a whim the other day with the regular old corn starch and water paints that I had given Phoenyx to play with in the tub, my eyes fell on the shaving cream on the counter. I decided to mix up some of my husbands shaving cream with the food coloring on the next fill up and the result was a puffy fun paint that dissolved in the bathwater! This shaving cream bathtub paint gave us an hours worth of painting bath time enjoyment and the beauty is we can make more at any time! And bonus is that it smells like my spouse…. 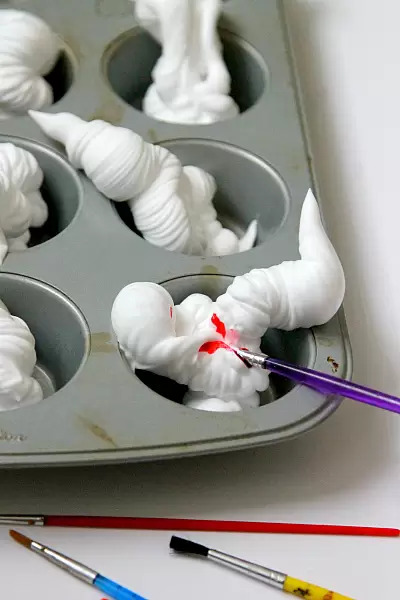 Fill up a muffin tin with a few squirts of shaving cream. I used white and blue and they both worked equally well and made bright colors, so no need to worry about the actual color of the cream. Use what you have! 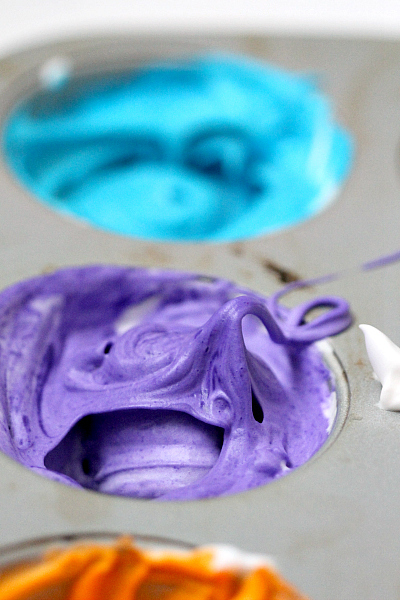 Add your food coloring to each shaving cream puff and stir! I use the type of food coloring that comes in little mini bowls rather than liquid, but I imagine it works well either way. That’s it! 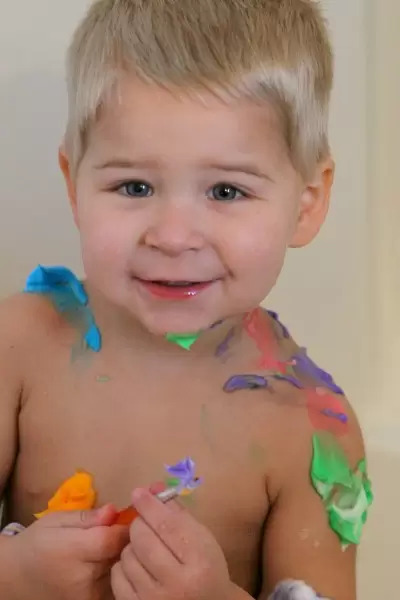 No step 3….step 3 is add some paintbrushes, deliver to your bathtub, and PLAY!!!!!!!!! The best part is that if there is any left in your tins, just rinse down the drain. « Rainbow Pasta Playtime! Inexpensive Fun. I actually have all the supplies. Joy. We’re trying this tonight. Thanks for the inspiration. Do the colors stain the kids? Absolutely love this idea! Will pin it and do it this weekend with the kids! So much fun! Oh my goodness this is fantastic. Love how easy it is to make. My kids would love doing this! I love how easy it is, too! His expression TOTALLY is like he can’t even believe you’re seriously going to let this magic happen. Love it! Oh you are such an awesome mama. I have to do this with Zoe, she would love it! My kids struggle with bathtime. I think making it fun with something like this would be helpful. Where do you buy your food coloring in jars? That would save me a lot of trouble in a lot of different things I do. What a fun idea. 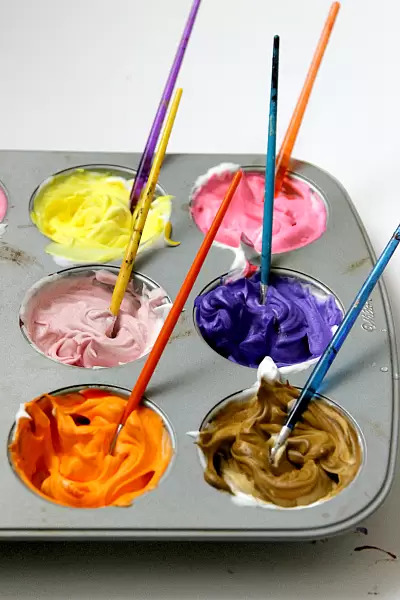 I would have never thought of using something like shaving cream and food coloring. When my girls were little, we bought stuff intended for the bathtub and it ended up staining! I didn’t use colored stuff much after that. You’re so creative! Cute idea! Did u find that any of the colors stained? This is such a clever idea! I love that you put it in a muffin tin for easy cleanup. What a fun idea! I would have loved this when my kids were little- it would have occupied them in the tub for hours! I need to make this for the kids. They would love it! I’ve wanted to make this for a long time because my daughter loves bath time but I keep worrying about the foodcoloring, well, coloring her. It doesn’t, right? the red does a little bit, but it does wash off. Its just food coloring, so while it IS dye, its not permanent. We just wash before we get out. They are both so cute! I have done this with my kids before and it cleans up so much better than the store bought ‘bathtub paint’. I’ve seen this mentioned a time or two across the net, but it’s nice seeing your kids having fun using it. I know mine would have a field day doing it that’s for sure. Especially my two youngest kids who always have a pencil and paper in their hands it seems drawing something. My kids would love this. Maybe the next not rushed bath night!! I’m doing this TONIGHT! I can’t wait to see Kennedy’s face. Okay, gotta know, where do you buy actual shaving cream? I haven’t seen that stuff in forever. All I can find around here is the shave gel (which I hate). This is such a great idea, what a money saver and fun project! I’m impressed with how all the colors turned out! What memories you’re making… love this idea! The colors are so pretty! Even my older girls would have a blast with this! Oh these are such adorable photos! !